"Our people are our product." The Brand Lady got off to a great start in her lecture to the assembled scribblers who dared to show up for her pre-ADT Championship press conference. Paragraphs of dialogue without anything to make fun of? They say that every new beginning comes from some other beginning's end. So with that in mind, as we come to the end of our 2007 season, we deliberately chose the ADT Championship as the first tournament to exclusively display our brand new logo, the LPGA's first new logo in 15 years, and one that truly reflects and celebrates the diversity, the global strength and the evolution of our brand. This tournament and our logo both epitomize our commitment to a bold new look and to bold business, especially when you look at the LPGA has taken ownership of the ADT Championship for the first time. This year everything you see, from beginning to end, the LPGA is calling the shots. Another first, we are actually producing all nine hours of television that you'll see. I don't know a lot about golf and television, but in general is that really something to brag about? Isn't it better when someone pays you to do the production? As we acquire more strategic assets, the LPGA brand will continue to flourish. Last month's launch of our first-ever on-line pro shop opened for business. For those of who have not visited, LPGAproshop.com is part of a merchandising program that we expect will grow to be a significant revenue stream for the LPGA. Is that definition of significant like the USGA's? Also located very closely to the media tent, not by accident, is our first-ever pro shop and merchandise shop, so please visit. You have all week. Please, slingers in attendance, tell me that last sentence was said with a wink and a laugh? Oh how would you know, you had already made your way to the door shop 'til you drop. All of these are signs that point to the strength of our product, to our members and to our brand. I want to thank you all for recognizing the talents and the attributes of our players and for sharing their stories with your readers. 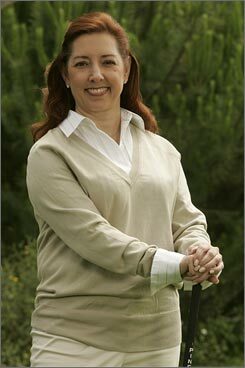 Outside the world of golf, coverage of the LPGA could be found in airline magazines, Business Week, Newsweek. In fact, in mid-October Lorena was actually the cover story on the Latin American edition of Newsweek. One of our greatest strengths is the fact that we don't separate our people from our product. Our people are our product. The LPGA is an organization, and our members as individuals are not afraid to assume greater responsibility and to hold us all to a higher standard. I wonder how many times she practiced that mantra in front of the mirror? Try saying "our people are our product." It isn't easy (on many levels). That's why she gets the big bucks. Q. I think, Carolyn, you said that the LPGA was producing the TV for this week. What exactly does that mean? CAROLYN BIVENS: It means that we hired a production company, Castro Communications, somebody we've worked with before. We've worked with the Golf Channel, with ESPN to get our production crew, accepted as the ones who would be producing and calling the shots. We've done profile pieces on just about every woman who's competing here. Those will run periodically during the telecast. We are doing the production of everything. That means we are covering the nine hours of this tournament. We've worked in combination with the Golf Channel and with NBC, but for the first time the LPGA will be guiding what is seen on television. Gee and I was looking forward to watching some of this.